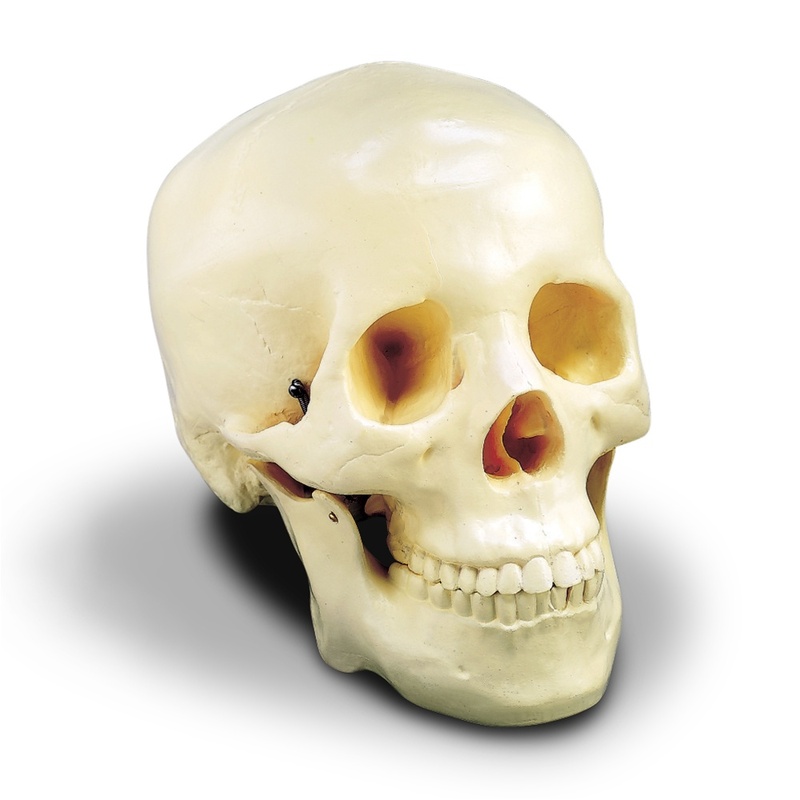 Our plastic, life-size, adult skull features a movable jaw on springs and an uncut calvarium. Size: 5"w x 8-1/2"h x 6"d.
Average Customer Review: 3.5 of 5 Total Reviews: 9 Write a review. I am planning on using this as a demo piece for a Halloween seance. It is a plain gray resin (which I have seen used for other plastic models). So I will have to paint it a bone color. I also have a few modifications I am planning on making to it (I need to open the bottom of the skull where the spinal column would go), so I may need to wear a mask to cut through the resin (if this is anything like the other resins I have seen in this type of modeling, it is considered highly toxic and much washing before during and after any modeling will be going on). I'm an art student and this product works fine for my drawing assignments. It's fine for an art student on a budget. If you want a really detailed skull, though, i suggest a different model. Things I like: Mine was painted with a matte paint, so reflected light is not a problem. The paint was a little bumpy, but nothing a quick brush with sandpaper couldn't smooth out. It is made out of a durable material and the spring jaw works nicely and fits where it is supposed to. It comes with three removable teeth, which come out with pliers and a little wiggling. Things I did not like: The mold seam is very visible on one side of the skull. The skull is not as detailed as I've seen on similar skulls. Places like the back molars are not completely formed, and the fusion lines on the cranium are not all present. There is no hole on the bottom for you to stick the skull onto a stick. Reviewer: Verified Buyer from MILWAUKEE, WI. THIS IS MY THIRD ORDER AND I'VE NEVER BEEN DISAPPOINTED WITH THE QUALITY AND THE FAST DELIVERY. The description says plastic but, I expected a hard plastic skull. Instead it was a soft plastic. You can actually squeeze the skull. It won't crush but, it does give. Reviewer: Verified Buyer from Birmingham, AL. I cover these skulls in mosaic tiles & decorate them in "Day of the Dead" theme. They are great to use if you are an artist. Very sturdy & truly life like. I will be ordering more.